This renewable energy giant is falling apart before our eyes. What: Shares of SunEdison Inc (NASDAQOTH:SUNEQ) plunged 59% in the month of November as investors continued to punish the company for a business model that looks riskier by the day. So what: SunEdison was going to use TerraForm Power (NASDAQ:TERP) and TerraForm Global (NASDAQ:GLBL) to fund acquisitions and buy projects as they were built. But as the yieldcos have dropped, it's reduced SunEdison's ability to grow, and SunEdison must now resort to selling projects to third parties. Worse yet, there was a board and management shakeup at both yieldcos, and members of SunEdison's management replaced former independent executives. SunEdison then sold $231 million in uncompleted projects in India to TerraForm Global, a strategy management had said it was abandoning, and transferred $388 million in liabilities related to the Vivint Solar acquisition to TerraForm Power. 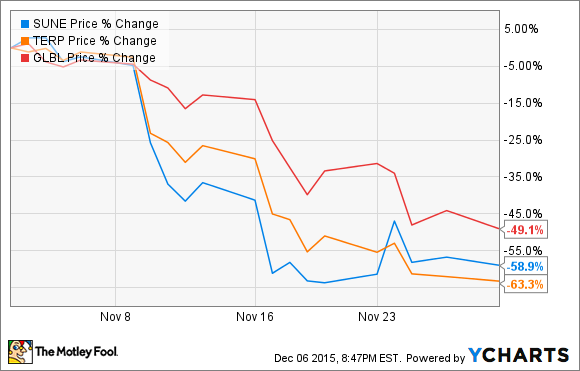 All of the confusion has led the entire SunEdison family of companies to drop like a rock. And with $11.7 billion in debt and continued losses, it's not certain SunEdison will survive long term. Now what: SunEdison's debt is a problem, but at this point, its corporate governance is becoming a problem as well. Management has changed strategies multiple times this year, and it's changing debt plans on the fly as well. That kind of uncertainty will keep me far away from the stock, despite the large potential market SunEdison and its yieldcos have in front of them.